Interviewer: Mr Restany, I would like to ask you a question. What are your impressions of this exhibition on the town’s forest lake? Pierre Restany: The pieces of art shown here on the water are work which may be considered sculpture, pieces of sculpture. One piece in particular stands out from this background and is neither an object nor something manufactured, and that is the work by SI-LA-GI with this luminous torch and the underwater fountain. 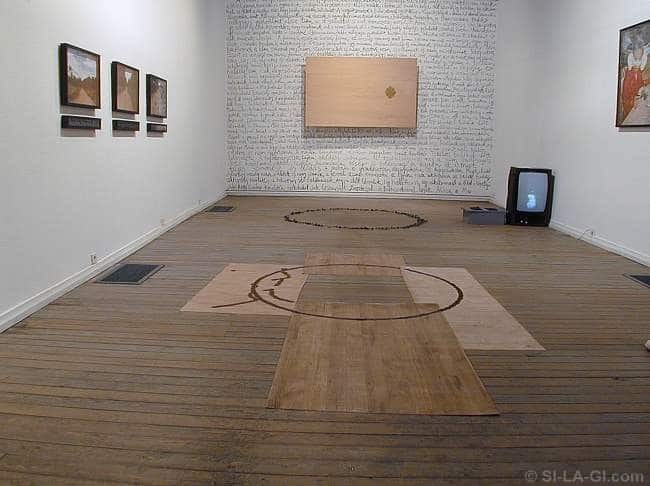 This work by SI-LA-GI is interesting basically because it corresponds to a means of communication. This piece of work which can be seen there at the foot of the bridge, below the bridge, is a piece which intrigues people and quite rightly makes them think. It is not presented as a finished work, as a finished product like all the other pieces. No, it is presented once again as a means of communication and as a signal. I think, therefore, that SI-LA-GI is someone who is synonymous with the whole evolution of contemporary art and, let us say, with the art of our global culture. We are living today through a dual phenomenon of cultural and economic globalisation. We are living in the Internet age and so information is distributed planet-wide and forces us also, doubtless, to reconsider its relationship to art. Art today, in our age of global culture, has become the humanist vector of communication. Thus strictly we should no longer speak of aesthetics, but of anthropology and precisely those new pieces which can now be seen in all those biennial exhibitions which at one time were exotic and which represent, if one may so describe it, the emerging periphery of the world, such as the biennial exhibitions in Cuba, Istanbul, Johannesburg, Cairo, Guangzhou, Korea; all these biennial exhibitions have shown the art of a new generation, and this new generation speaks a language of communication not, let us say, in terms of aesthetics but in terms of anthropology. The artists of today, who can be found in the four corners of the Earth, in the former Third World, all express themselves through a sort of Esperanto which is the language of global culture and which is made up of communication signals. These communication signals are recycled industrial material, manipulation of photography, installations, performances, videos, virtual realities. All these elements are not intended to constitute a fully completed piece of work such as you see here, entirely finished. The volumes are controlled or the subject matter is studied. No, these are works which put the spectator in the position of receiving a message, and this message is no longer a message of beauty, i.e. of aesthetics, but an anthropological message, a message of truth. And it is precisely this truth in communication which is passed on by these methods of information. Thus this piece of work by SI-LA-GI is a piece which is in some way the alarm signal in this exhibition. It is a beautiful exhibition taken at the level of the modernity of the pieces of art, but it is also an exhibition which opens out into this question mark signed SI-LA-GI. I admit to you therefore that, over and above the pleasure which I feel from being in this spectacular place and seeing once again the work of my fellow sculptors, I have also had here an experience of communication thanks to SI-LA-GI, and so I truly think that I have not wasted my time, and I am very happy to be here. Interviewer: Mr Restany, I would like to put two more questions to you. Have you seen SI-LA-GI’s exhibition entitled Hanging Gardens which is being held at the Fészek Gallery? Pierre Restany: I have seen it, and it was precisely there that I developed further all the interest which I have in the work of SI-LA-GI. This exhibition is linked to the idea of death, of pain, considered in some way as means of compensating for the existential emptiness which we nurture in the depths of our very beings. 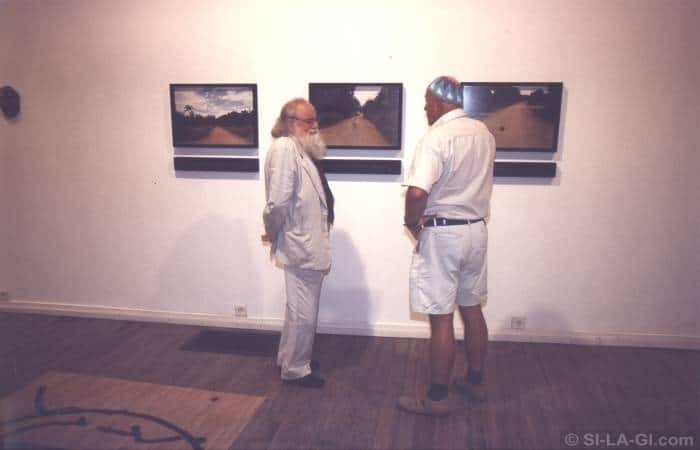 Behind, if it may be so expressed, this philosophical vision of things, I was particularly struck by three photographs on one of the walls in the exhibition at the Fészek Gallery. On the first there is little road and much sky, and a person can be seen in the far distance. And the idea of this image is that with distance no one particularly notices the, let us say, suffering, because the person, who is very small, is someone who is in fact crippled. In the second, there is a little more of the road and a little less of the sky and there one realises that with a distant perspective one takes no further notice of the weather. Finally, in the last, there is a large amount of road and almost no sky. There is a hat or helmet in the middle of the road and SI-LA-GI told me that, after having photographed this helmet that had fallen onto the road, someone told him that it was the place where a motorcyclist killed himself a few hours earlier. Thus, with distance one also does not notice the death. And these three photos of different roads seen with different eyes make up something like the image of the Tao, of the path of existential balance and, let us say, of the peace of the heart. Therefore, these devices of SI-LA-GI make one think, are most enriching, and make one discover signs which are not apparent at first glance. There is almost a sort of relational aesthetics, aesthetics which have a bearing on the elements of relationships. So it is aesthetics which are a part of all these rituals of anthropological non-verbal communication. These are rites, basically. And these rites which are neoprimitive rites, but also extremely modern, are without a doubt the departure point for a whole range of modern artistic research linked once again to global communication. And in this sense, I must say that the experience which I have just had was for me very meaningful. Pierre Restany: You know, these are artists who, even today, because they have a sense of history, have a sense of communication, clearly collide with all our prejudices, mine as much as anyone’s. In order to reach these conclusions, I had to take it upon myself to make a very great effort be open to evolution and transition. This calls for an evolution of our perceptions and certainly for a new way of seeing art and thought. I told you just now, when I spoke of aesthetics, that true as anthropology may be, that is clearly all phenomena, references, a new way of thinking with the Internet, with all these electronic communication systems. It is certain that our way of seeing the world and other people will change radically. This transplant between electronic machines and our brains will not take place in a merely inoffensive way. It is certain that our children or grandchildren, who will grow up entirely within this electronic world of computers, will act differently. The Internet is in the process of becoming our planetary memory, both individual and joint. Our children will tell themselves that it is useless to make the effort to memorise certain basic facts which make up our memories and our identity because we have them at our fingertips on the computer. We will free up all our mental energy, we will have to transfer it to perceptible energy and perhaps we will have a great opportunity, or rather future generations will have a great opportunity, that of developing further those of our senses which today are drugged, the sense of smell, of taste, of touch, to have a stronger and more sensual approach to the world and to our own sensitivity. Look at all the developments already made in what is called ‘body art’, which today has become in truth a situation where the body is objectified, the body, we are making an object of our own bodies, we are distancing ourselves from them to an enormous extent. This is something which was still unthinkable twenty years ago. Thus, things are evolving greatly in this area and I see that we are living in an extremely interesting age. In any case, the presence of SI-LA-GI here is precisely… the great difference between his approach to the public and that of the others is a meaningful phenomenon.